God gently lifted Jessie L. Mohler, 100, of Delta to Heaven on January 31, 2019. Jessie was born in Lyons, Ohio on August 28, 1918 to Charles Rollin and Lena Kerr Elarton. During her elementary years she attended school in Lyons and moved to Liberty Center for her high school career. She graduated from Liberty Center High School in 1936. On June 20, 1941, Jessie, married her high school sweetheart, M. DeMont Mohler, who preceded her in death in 2005, after 64 years of marriage. Jessie spent her life as a humble, selfless, servant to her church and community. 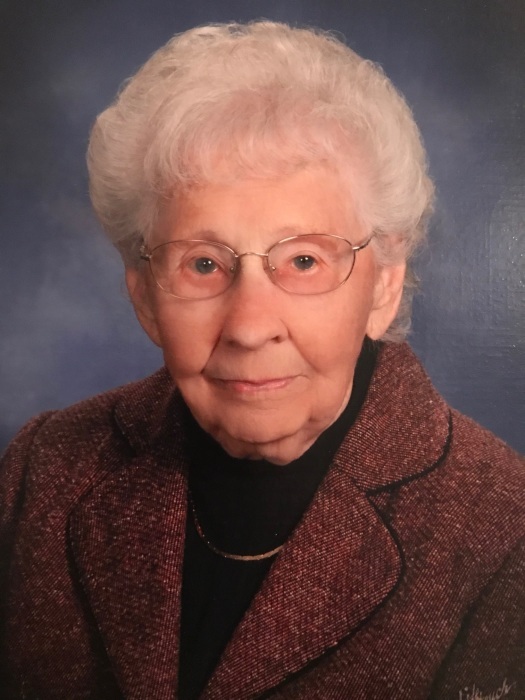 She spent countless hours teaching Sunday School at the Delta Methodist Church, led Girl Scout Brownie troops, matron of Aetna Juvenile Grange, and was always cooking for others. In her later years she crocheted afghans for everyone she knew. She shared her smile and her laughter with everyone she met and will be deeply missed by her grandchildren and great grandchildren whom she greatly spoiled every chance she could. Jessie is survived by her three daughters: MaryAnn Enyart of Delta; Kathryn (Steve) Rettig of Archbold; Jean (Robert) Krieger of Remus, MI; seven grandchildren and spouses; and sixteen great-grandchildren. Jessie was also preceded in death by her son-in-law, Jerry Enyart and her grandson-in-law Chad Saathoff. Interment service will be at Greenlawn Cemetery in Delta on Saturday, February 9 at 10:00 AM. Visitation with the family will follow at Delta United Methodist Church, 101 Northwood Dr., Delta, Ohio 43515 from 11:00 AM - 12:30 PM with a Memorial Service beginning at 12:30 PM. Those planning an expression of sympathy are asked to consider memorial contributions to the Delta United Methodist Church or a charity of the donor’s choice in her name. Arrangements have been entrusted to the care of Barnes Funeral Chapel, 5825 St Hwy 109 in Delta. Online condolences may be sent to the family through our website at www.barnesfuneralchapel.com.